This article was first shared in April 2011. We had more than our fair share of Easter sweets this weekend, but I had a plan all along to purge our house of all that extra sugar by “gluing” it to some sort of base, like a paper plate, and calling it art. As I talked to my almost three-year old about the idea, we mused over what we could glue our candy to. 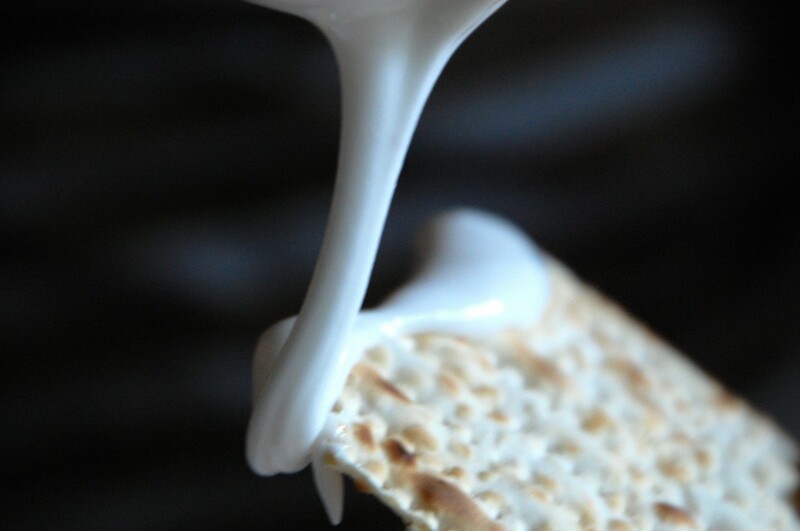 Something bigger than a cracker. Something flat. Something hard. Something we already had in our pantry. 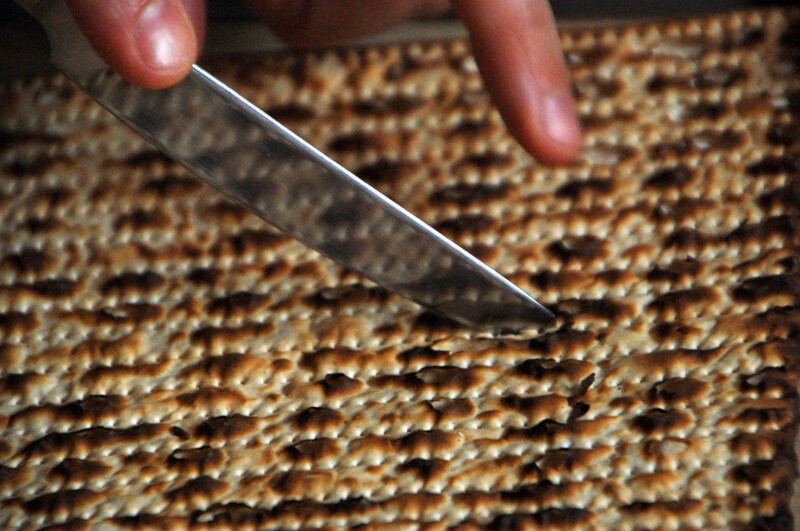 And then it occurred to us — Matzo! 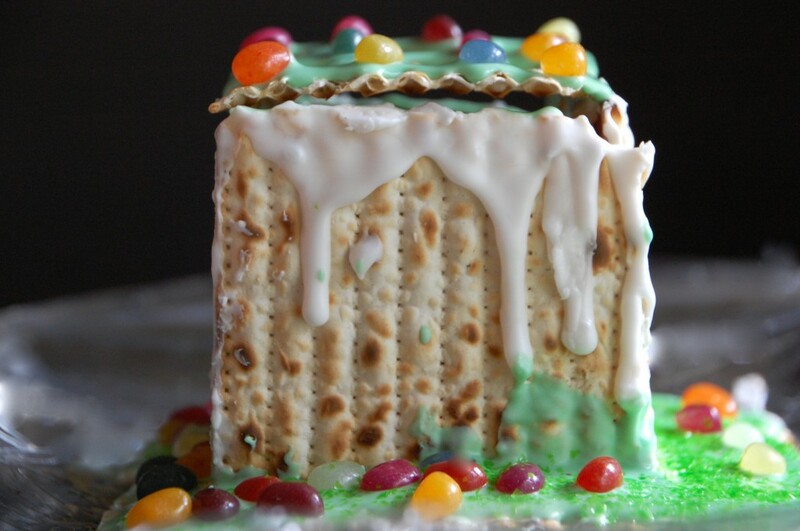 The irony of mixing Easter jellybeans with Passover matzo isn’t lost on me. As I laughed about this with my husband, we also realize that this is a fair representation of of our melting pot family. And I’m sure we’re not the only ones these ingredients on hand?! What I especially love about this project, which looks oh-so-similar to the beloved gingerbread house, is the reminder that we can borrow ideas from other seasons. Here’s another seasonal mash-up from last summer: Easter in August. N started with some matzo and enjoyed breaking it into smithereens. She’s two, after all. Totally unusable for this project, but super fun. 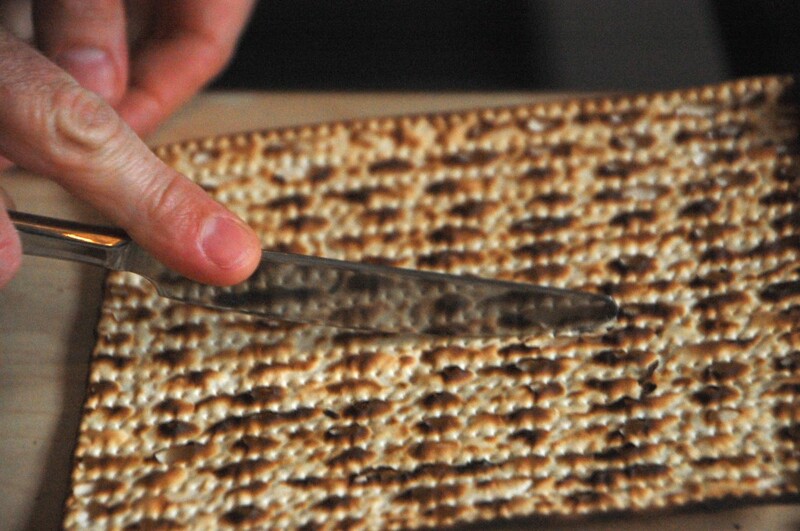 If you’ve ever broken matzo with the intent of making neat little sandwich, you know that matzo has a mind of its own and can be completely unpredictable. It’s still a little wobbly, but it worked SO much better than my sad attempt at breaking them by hand. I since found another strategy that sounds worthwhile: dip your finger in water and run it down the groove you intend to crack. 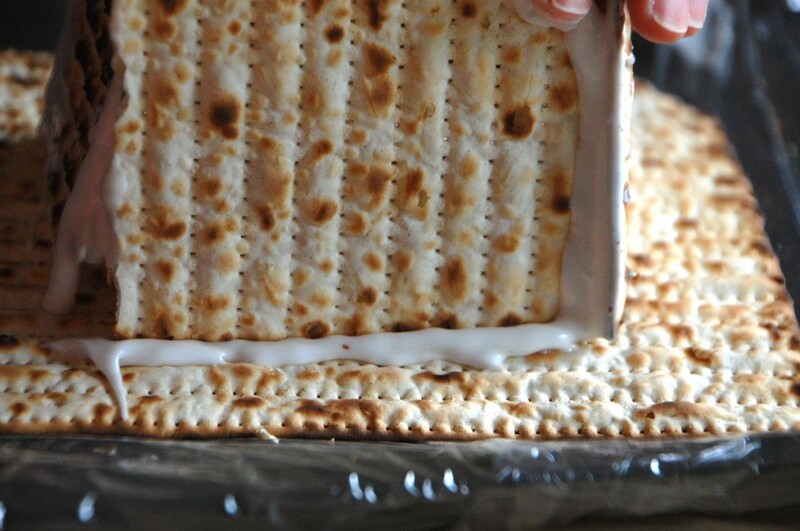 It will soften the matzo just enough so that you can get a clean break. Then we attached the pieces together with ornamental frosting, which dries hard. 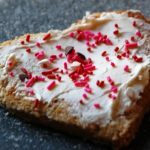 Our ornamental frosting was too runny for the job, but I’ll share the recipe below just in case you want it. Instead, I’d recommend the royal icing recipe that we used for our gingerbread houses. Add water to meringue powder and beat until soft peaks form. Add sugar into the mixture and beat until it’s the desired consistency. Add more sugar for stiffer icing. Blend it together until smooth. If you’re not using the frosting right away, cover the top of your bowl with a damp towel to keep it moist. We attached the “wall” pieces to a large matzoh base. And then added jellybean decorations. That leaning wall is the result of one of my hand-breaking attempts. Sad. Looks like a foundation problem. I finally conceded to the frosting-coated jellybean eating request. I can be tough! 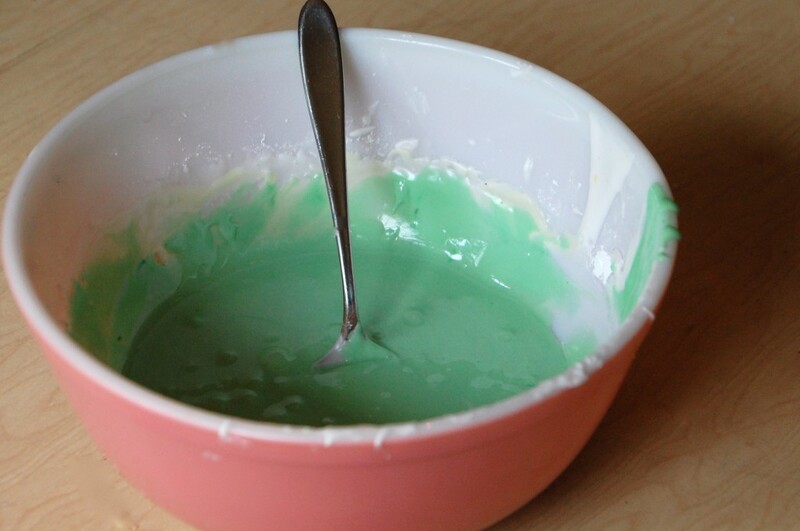 …so we colored our frosting green. So we added a roof. Voila! 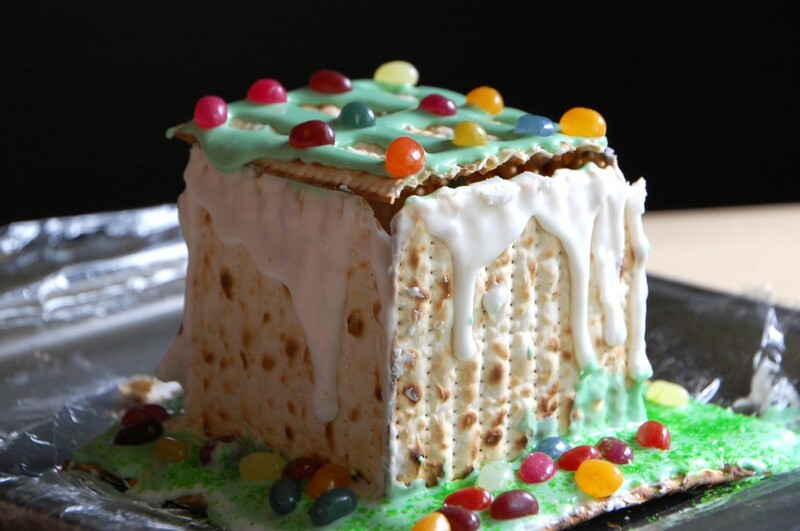 Jellybean Matzo House (with icicles) for Spring. 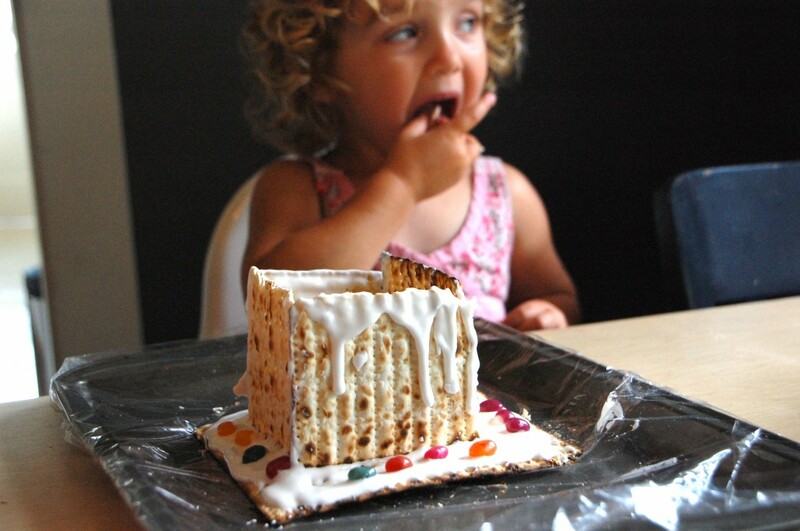 I had to do a search on Matzo Houses and found this one from Martha Stewart that’s held together with chocolate. 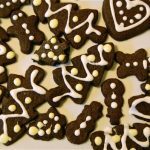 I found a website called Chrismukkah: The Merry Mish-Mash Holiday. Here’s their very pretty (inedible) version. This one looks yummy, covered in chocolate! Do you have a good idea or tip for making candy houses? this is so cute! reading this reminded me of a time in middle school when i created a roman theatre in the round out of those white brick-shaped peanut butter candies (branches brand, i think?) and other yummy treats and my class left it in ruins before my presentation was over. haha! we’re all holiday mashed-up, as well. 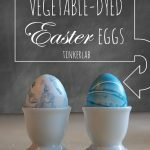 our buddhas wear a santa hats in december, and we dye eggs on the spring equinox to celebrate the pagan holiday and the earth. I am so sharing this with my sister! I come from a family that celebrates both holidays so this cracked me up when I saw it. What a great use of holiday leftovers! Your photo documentation continues to impress, Rachelle. Wonderful stuff! Awww, Suzette, you’re so kind. Thank you! hmmmm….. not a pitched roof on that one! This looks quite tasty, and edible! This is a nice version of the old gingerbread houses. Thanks, Brenda! It could be edible, but right now it’s collecting dust on our counter-top. I love this idea. I actually have an opened-long-ago-but-never-finished box of matzo that’s been taking up space in the cupboard and some mini-marshmallows and bits and pieces of gummy bear candy and a few stray lollies. Perfect! 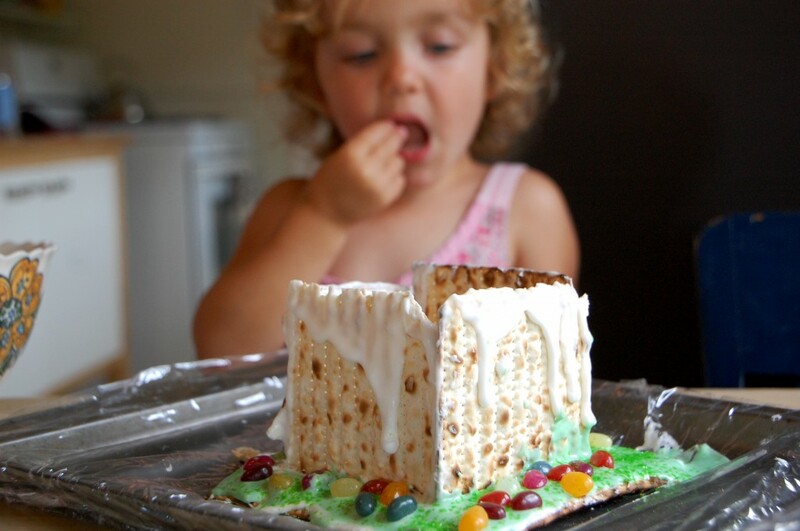 Love your little jellybean matzo house and such a pleasure to see you on Craft Schooling Sunday! Hope to see you again soon, and all the best! 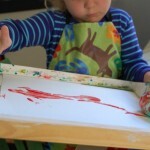 Just came across your site on Craft schooling Sunday. What an original idea. 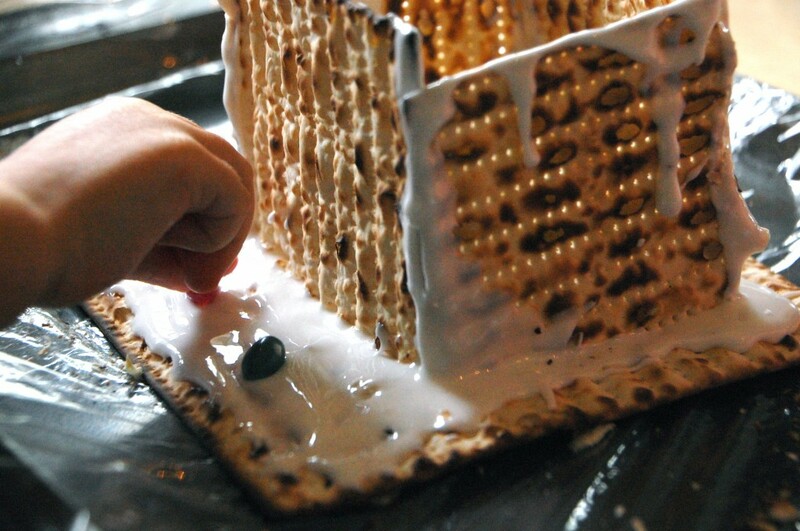 I’ll have to try this next Passover (or maybe sooner). 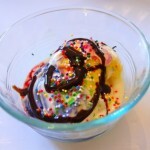 Through your own creativity, you could make various style to make your food more appetizing. This would catch everyone’s attention that would surely entice them to try it on their own. 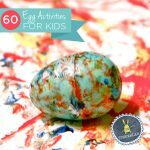 What a fun way to get kids involved in Passover! 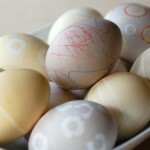 Iâ€™m doing a spring link up today over on my blogâ€¦http://rustsunshine.blogspot.com.Â Would love it if you would join us!